We recently completed an update of American Humane’s Guidelines for the Safe Use of Animals in Filmed Media as part of our continuing effort to address new knowledge, experience and techniques regarding the use of animals in filmed entertainment. The June 2009 update is part of our ongoing work to determine better and safer practices for protecting animals in filmed entertainment. This revision follows ongoing intensive evaluation, alteration, updates and, in some areas, expansion of guidelines by American Humane’s advisory panel of recognized authorities, including veterinarians, national animal welfare leaders, film industry professionals and primatologists, as well as experts on other species. The 2009 edition has added information on topics such as Reality Programming, Camera Car Safety, and Rodeo Simulation, as well as additions to existing chapters. American Humane Certified Animal Safety Representatives™ undergo extensive classroom and field training to fairly and comprehensively apply the Guidelines where appropriate. Because American Humane’s Film & TV Unit is the only animal welfare organization with access to productions for the purpose of monitoring the safety of animal actors, no entity or individual can enforce compliance with the Guidelines without the written approval of American Humane. Approval is given when an individual or entity successfully completes the American Humane training program and receives full certification. This is often the case with employees of other animal welfare organizations who, having completed American Humane’s training, act as on-set monitors overseas. Because the Guidelines exist to support productions featuring animal actors, and because the Guidelines are accessible in printed form and online, American Humane cannot assume responsibility for the inappropriate or unauthorized use of the information contained in them. Although links to the Guidelines may be offered through other websites, American Humane does not control the content and information contained on those sites and thus cannot attest to their accuracy. 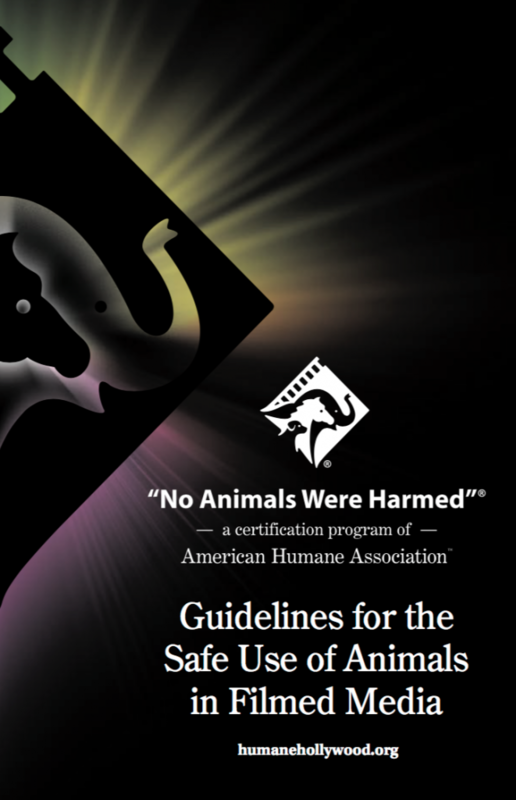 The information provided in American Humane’s Guidelines may not be reproduced, in whole or part, without specifically referencing American Humane and the Guidelines. American Humane’s Film & Television Unit continues to respond to changes in the entertainment industry by maintaining the Guidelines as a “living document.” We encourage animal trainers/handlers, filmmakers and productions to check our Guidelines online periodically to keep current with new provisions, for the safety of the animals.